This easy apple cobbler recipe is a family favorite dessert that pleases everyone. It’s best made with tart apples like Gravenstein or Granny Smith. 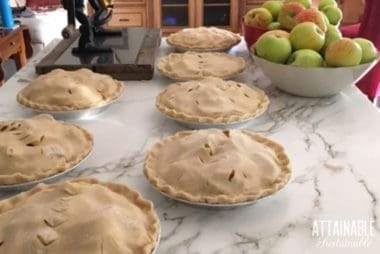 My mom’s apple pie recipe is straight off the apple farm, tastes fabulous, and is a crowd-pleasing dessert every time it’s served. 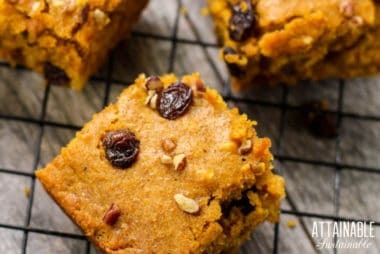 This pumpkin spice bar recipe holds together well, making them a great addition to a potluck table. They’re easy to pick up and eat without needing a plate. I get a big thumbs up whenever I bake these pumpkin bars. Just don’t tell anyone how incredibly easy they are to bake! These Healthy Gluten-Free Chocolate Chip Cookies make chewy cookies that don’t fall apart into crumbles like gluten-free baked goods often do. This homemade kahlua recipe starts with freshly brewed coffee instead of instant granules. It’s great for gift giving or simply indulging yourself. This homemade cranberry sauce with orange and ginger will rock your holiday table. It’s sweet and tangy and very flavorful. A perfect addition to the Christmas or Thanksgiving buffet. It’s got much more flavor and depth than the jellied cranberry sauce that comes in a can. Cranberry sauce with orange is a winner! These pumpkin custard cups have been a go-to dessert for us for years. This gluten free pumpkin dessert is loved by everyone who tries it! These healthy apple recipes are sweet & savory. 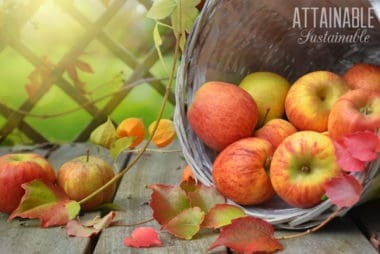 When it’s harvest time and apples are abundant, bake some up into a pie, crisp, or cobbler for dessert. 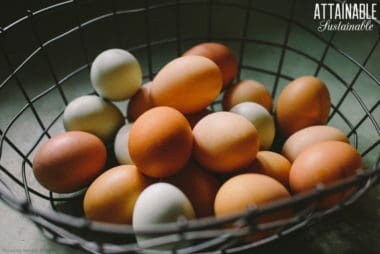 Springtime generally means an uptick in fresh egg production for those of us who have laying hens. These egg recipes will help you use them up without boring repetition!